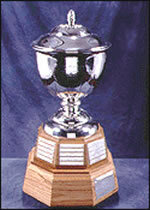 2009 NHL Awards – Norris Trophy | f.e.g.n.s. Mike Green was hands down the most successful defender in terms of offensive production this season. He is first among defenders in goals, points, and powerplay goals (with 31, 73, and 18 respectively), and he broke the NHL record for most consecutive games with goals scored by a defender (he scored in 8 straight games – a feat for a player at ANY position). He is only the seventh defender in NHL history to score more than 30 goals in a season, and he was incredibly close to breaking the NHL record for powerplay goals by a defender (19 – set by Sheldon Souray in 2006-07). Finally, considering that Green accumulated these remarkable numbers playing only 68 games this season (10 less than Lidstrom’s 78, and 12 less than Chara’s 80), you can truly start to see just how special of a season he had. Six time Norris Trophy winning defender Nicklas Lidstrom once again had a tremendous season, though his age does appear to be catching up with him a bit as his point totals have finally started dropping out of the heavens. Lidstrom finished with his lowest offensive output since the 2004 NHL lockout, putting up “just” 59 points this season. While this is the first sub-60 point season in several years, Lidstrom still boasted an impressive plus-31 rating and is still one of the best shutdown defenders in the NHL. He matches up against opposing teams’ best players every game, and does so with such ease and proficiency that sometimes you wonder why he’s “only” won six Norris trophies in his career. Perennial favorite Lidstrom will give Green a run for his money (as Lidstrom excels a bit more than Mike Green in the defensive aspects of the game)… but Green’s amazing season will likely instigate a “passing of the torch” of some sort in this award, as we see the next generation of defenders start to take over where guys like Nik Lidstrom have left off. For the second season in a row, big Zdeno Chara has been nominated for an award that he will not (likely ever) win. Chara is an absolute monster in the defensive end, a force that no player wants to deal with on a consistent basis, but at the end of the day… it’s easier for voters to look at statistics than it is for them to look at the types of intangibles that Chara brings to his team. No defender has won the Norris Trophy with as few points as Chara had this year (50) since Bobby Orr won it in 1967-68 with 31 points in 46 games. That’s a lot of years and a lot of precedent towards “offensively minded” defenders going up against Chara. As Bruins writer Matt Kalman writes: There’s no way Chara should lose this vote. But unfortunately too many of my colleagues in the PHWA probably relied on stats and highlights to make their votes. The things that made Chara the best defenseman in the league hardly ever showed up in those two places. All you have to know is he was the No. 1 blueliner on the best defensive team in the league and the team with the second-best record. That’s something neither of the other finalists can claim. What Mr. Kalman fails to understand is that the Norris Trophy is not simply the award for the “best defender.” With the advent of Bobby Orr, the Trophy has taken on more than that role. This award has changed throughout the years, and should now be looked at as an award for the “best player at the defender position.” While Chara’s defensive abilities should never be discounted completely, Mike Green 30 goals (many of which were absolute sniper-like shots) just cannot be overlooked either. This year, Mike Green was the “best player at the defensive position.” This year, Mike Green should win the Norris. This entry was posted on April 23, 2009 at 7:34 pm and is filed under Hockey with tags Bobby Orr, Boston Bruins, Detroit Red Wings, Hockey, Mike Green, NHL, NHL Awards, Nicklas Lidstrom, Norris Trophy, Sheldon Souray, Washington Capitals, Zdeno Chara. You can follow any responses to this entry through the RSS 2.0 feed. You can leave a response, or trackback from your own site.